The Chorus Of The Song Was Written By Thomas Ashe and while writing the song I though it would be a fitting tribute. And bring forth Erin's day. 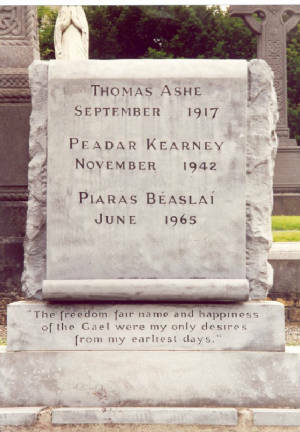 Thomas Ashe was a native of Dingle, Co. Kerry. An active member of the Gaelic League. At the time of the 1916 Rising he was employed as a National School Teacher in Corduff, near Swords. He took a leading part in the Volunteer operations in the Co. Dublin, notably that of Ashbourne, where a fierce conflict between police and insurgents took place, lasting five hours. The police casualties were heavy: the County and District Inspectors, two sergeants and four constables were killed, and 16 constables wounded" The Volunteer casualties were slight. After the surrender Thomas Ashe was tried by court-martial. He was sentenced to death. This was com­muted to penal servitude for life. He was released at the General Amnesty', 1917. After his release he addressed a number of meetings. Charged with sedition in a speech at Ballinalee, he was convicted on the evidence of police 'mental note takers,' and sentenced to two years' imprisonment. He was committed to Mount joy, where several other political prisoners were confined. He went on hunger strike as a protest against criminal status. After six days he was removed to the Mater Misericordiae Hospital, where he died five hours after admission. We find the deceased, Thomas Ashe, according to the medical evidence of Prof. McSweeney, Sir Arthur Chance, and Sir Thomas Myles, died of heart failure and congestion of the lungs, on the 25th September, and that it was caused by the punishment of taking away from his cell the bed, bedding, boots, and left to lie on the cold floor for fifty hours, and then subjected to forcible feeding in his weak condition, after a hunger strike of five or six days. We censure the Castle authorities for not acting more promptly, especially when the grave condition of the deceased and other prisoners was brought under their notice by the Lord Mayor and Sir John Irwin. That the hunger strike was adopted against the inhuman punishment inflicted, and as a protest against their being treated as criminals, and demanding to be treated as political prisoners in the first division. We condemn forcible or mechanical feedings as an inhuman and dangerous operation, and should be discontinued.
' That the assistant doctor called in, having no previous practice in such operations, administered unskillfully forcible feeding. That the taking away of the deceased's bed, bedding and boots was an unfeeling and barbarous act, and we censure the Deputy Governor for violating the prison rules and inflicting punishment which he had no power to do, but we infer he was acting under in­structions from the Prisons Board of the Castle, which refused to give evidence and documents asked for." On the following Saturday night an official statement was issued from the Privy Council, granting concessions to prisoners. Modification of treatment was decided on. So by his death Thomas Ashe won the prisoners' fight— that was in 1917.